When ice is warmed, the water molecules forming its structure vibrate more and more vigorously until finally the forces between them are no longer strong enough to hold them together the ice melts and turns into liquid water. Quantum physics predicts that similar phenomena can be observed if the quantum mechanical fluctuations of the particles in a material can be altered. Such changes of state triggered by purely quantum effects known as quantum phase transitions play a role in many astonishing phenomena in solid-state systems, including high-temperature superconductivity. Researchers from Switzerland, Britain, France and China have now specifically altered the magnetic structure of the material TlCuCl3 by exposing it to a varying external pressure at different temperatures. By performing neutron-scattering measurements, they could observe what happens during a quantum phase transition, and compare the "quantum melting" of the magnetic structure with the classical "thermal melting" phase transition. Whether water is liquid or solid, in the form of ice, depends on which of two energies gains the upper hand. One is the bonding energy of the water molecules, the other the kinetic energy of molecular motion, which becomes increasingly vigorous the higher the temperature. If ice is heated above zero degrees Celsius, the movement of the molecules becomes so intense that the hydrogen bonds are no longer able to hold them together and the ice melts. The overall physical state is changed or, in physics terminology, a phase transition occurs. A similar phenomenon can be observed in magnets if a magnet is heated, it becomes non-magnetic and for a similar reason. We can imagine the magnet being made up of many tiny bar magnets, which physicists refer to as magnetic moments. If all these moments are aligned in parallel, the entire material is magnetically ordered and behaves like a magnet. If the material is heated, the direction of the moments fluctuates more and more strongly until the aligning forces are overcome and the magnetic order disappears: it has effectively melted. This "classic" melting is triggered by changes in temperature, but a comparable and equally fundamental phenomenon is determined by the laws of quantum physics. Quantum mechanics informs us that certain properties of particles in a material cannot be known exactly. This uncertainty is often referred to as quantum fluctuations: analogous to the classical fluctuations described above, the position of particles or the alignment of magnetic moments fluctuates over time. While the origin of the two kinds of fluctuations is completely different, in some situations they may have rather similar effects. A "melting" of the net ordered state of a system triggered by quantum fluctuations – a quantum phase transition is the quantum-physical counterpart of the classical, thermal phase transition. Quantum-mechanical phase transitions are the key to many of the most exotic phenomena in solid-state physics, including high-temperature superconductivity. The researchers studied the arrangement of the magnetic moments. In TlCuCl3 the moments come in pairs, and at low pressures the magnetic forces between pairs are at their weakest, giving a state with no magnetic order. "However, this disordered state looks completely different from a classical disordered magnet, where the directions of the magnetic moments are simply random," explains Christian Rüegg, a laboratory head at the Paul Scherrer Institute and supervisor of the research project. "Here, on the other hand, two neighbouring moments form a magnetic pair, with the two moments pointing in exactly opposite directions. The interplay between neighbouring pairs, however, is not strong enough, so no long-range order is formed." In this case, the laws of quantum physics do not stipulate which of a pair's moments points in which direction and this complete uncertainty about the orientation of the individual moments corresponds to the strongest quantum fluctuations. If the pressure is now increased, the magnetic moments move together so that the moments from neighbouring pairs feel each other more and more strongly until the paired state is replaced by a long-range magnetic order: a quantum phase transition comes about due to the pressure. In their experiment, the researchers focussed primarily on the magnetic "excitations" inside the material, which provide extremely accurate information about the quantum states of the moments. These excitations can be imagined as a common, coordinated oscillation of the magnetic moments, much like a water wave or the vibration of a guitar string. The excitations are linked to magnetic "disorder" in the material as the more excitations there are, the more vigorously the magnetic moments fluctuate. Quantum physics dictates that most magnetic excitations in TlCuCl3 require a minimum energy to excite, and how easily these can be triggered depends on the interactions between the magnetic moments controlled in this experiment by the temperature and by the pressure exerted on the sample. 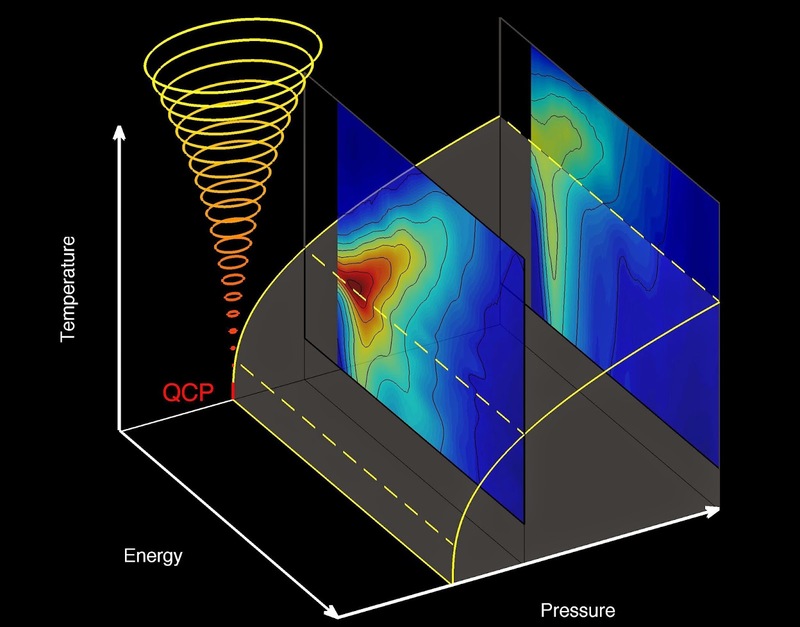 The researchers demonstrated that some excitations at both low and high pressures require rather high energy levels and are rarely occupied. However, if the pressure is adjusted towards the value where the quantum phase transition occurs, the minimum energy decreases and a number of different excitations can be observed. These also include one whose origin and mathematical description is exactly analogous to the Higgs boson in elementary particle physics, with the result that some researchers refer to the Higgs particle in solid materials. Rüegg explains: "We were absolutely astonished to find that these excitations played a key role, irrespective of whether the order was destroyed by quantum-mechanical or by classical fluctuations – a fascinating feature of quantum phase transitions." The researchers conducted neutron spectroscopy experiments using neutron sources at the Paul Scherrer Institute and the Institut Laue-Langevin. In their measurements, they passed a stream of neutrons through a sample of TlCuCl3 and observed how the flight path and speed of the neutrons changed. This enabled the team to study both the magnetic order and the excitations: if the neutron emerges moving more slowly than it entered, it must have lost its energy by triggering an excitation. 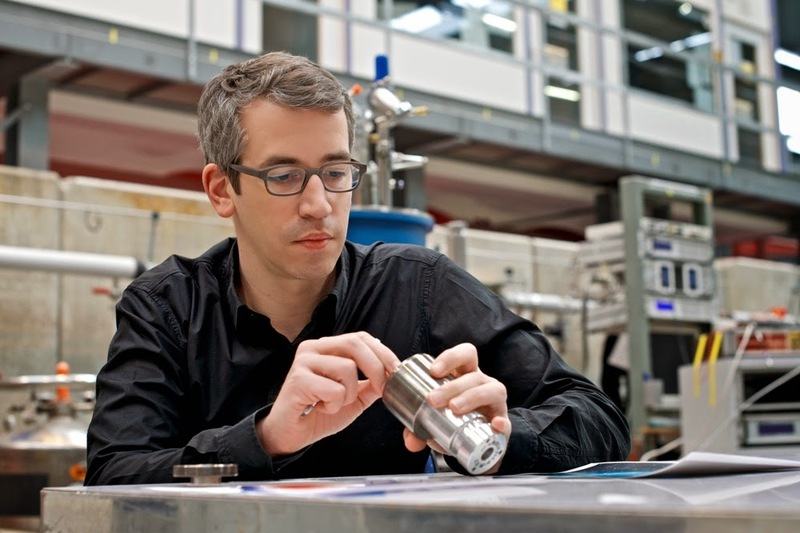 "These fluctuations can only be observed with neutrons and it's vital that you have the opportunity to study the sample at different pressure and temperature levels," explains Martin Boehm, who supervised the measurements at the ILL. "In doing so, we benefit from one of the essential characteristics of neutrons: they can fly through the walls of the pressure cell where the sample is located practically unimpeded." "This type of spectroscopic experiment can be conducted for the first time with TlCuCl3 because the magnetic interactions are so sensitive to the applied pressure," explains Rüegg. "In all the other materials we know you need a far greater pressure, which means you can only use very small samples much too small for spectroscopic experiments with neutrons. Alternatively, you could try to produce many different samples that vary slightly in their structure but this would take a very long time and still would not yield a complete overview of the behaviour."